Whether you're hiking across a muddy trail or walking to the office, your feet pick up a tremendous amount of dirt that you don't want ruining the interior of your Wrangler. 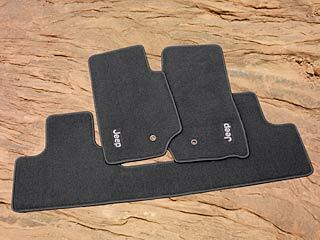 You can protect those precious footspaces with these premium Jeep Wrangler carpet floor mats. These premium mats are custom tailored by Mopar to match the interior of your 2007-2018 Wrangler. They feature the same look as a set of mats you'd get from a dealer, but offer a thicker-than-usual carpet surface to handle even more dirt and moisture without damaging the surface below. And with Just for Jeeps, you'll pay much less than you would at a dealer - we offer hefty discounts and outstanding shipping deals. We offer a variety of configurations for two-door and four-door Wranglers. Call us today with your questions - our staff is filled with experts who are just as crazy about Jeeps as you. Find out the difference Just for Jeeps makes at providing low costs for OEM Wrangler floor mats and other parts. 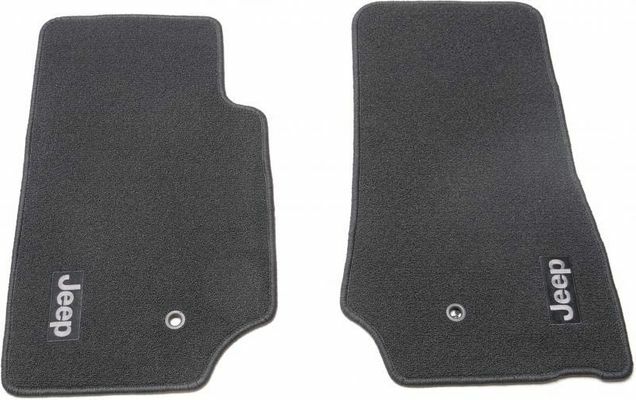 4-Door (Front & Rear Mats) or 2-Door (Front Mats Only), Premium 20 oz. Sisal Carpet, with Jeep logo. Please select above. Great replacement mats, thicker and very comfortable under your feet. This was perfect for my girl�€™s JK! She had some thin ones and no name from dealer. I got her these as a gift and she really likes them. The fit perfectly and gives her inside a nice finished look. As always, J4J has excellent customer service, fast shipping and great products! ProsNice finishing touch on the interior. ConsWish the back mats had ?Jeep? on them as well. These look great. I bought a pair a year or two ago. The mats carpet held up pretty good but the log wore loose on the driver side recently so I ordered another pair. I still recommend them but maybe you guys could use a little better glue or if you moved the position of the logo so the persons foot wasnt always in contact with it it would last longer. These floor mats are great! They are more plush than the originals, and fit perfectly. ProsJust as I expected, except that they are more plush! Floor mats, just bought so I do not know how durable they will be, but a perfect fit and match. Great price and fast shipping. Very good experience Web site very easy to navigate shipping fast and easy I give it a 10. These mats are truly premium mats. Quality Mopar pars.